Danish schmidt hammer lassen architects and New Zealand based Architectus have won the commission to design the New Central Library in Christchurch, New Zealand. 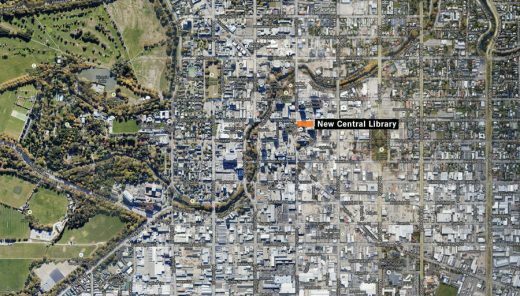 The new library, which will be up to approximately 12,000 square metres, will be one of the anchor projects in the Recovery Plan for the city of Christchurch after the damaging earthquakes in 2010 and 2011. The Christchurch Central Recovery Plan provides the framework for the redevelopment of Christchurch city centre, which was severely damaged by earthquakes in 2010 and 2011. The previous Central Library on Gloucester Street was badly damaged and the land it stands on has been designated for the city’s new convention centre. The design concept for the Recovery Plan is for a greener, more accessible city with a compact city centre and a strong identity. The aim is to become a city for all people and cultures recognising, in particular, the Ngai Tahu heritage and places of social and historical significance. The Recovery Plan lays out precincts and anchor projects to catalyse investment, growth and social energy that will bring people back into the city centre. The New Central Library is one of these anchor projects. “The New Central Library will be a social gathering point in the rebuilt city. It will provide easy access to digital technologies and local heritage collections. There will be exhibition and performance spaces, a learning centre, spaces to relax – indoors and outdoors – and activities to entertain and educate young people,” explained Morten Schmidt, founding partner at schmidt hammer lassen architects. Christchurch City Council required architects with experience of designing large libraries and public buildings. schmidt hammer lassen architects has designed an impressive list of libraries: eight completed and four currently under construction. The best known is the Royal Library in Copenhagen – the Black Diamond – which has set new standards for academic libraries all over the world. The most recently completed library is the Aberdeen University New Library, which received a prestigious RIBA award in 2013. Under construction is Aarhus’s new public library, Dokk1, which will become Scandinavia’s largest library, and Halifax Central Library in Canada. Both are due for completion in 2014.